Whether you are currently struggling with a chronic health condition or not, you likely know someone that is. The truth is, everyone struggles with something. It is my goal to bring this to the forefront and take the shame out of it. In this talk you will learn how to not be sidelined by a difficult experience, how to go from “Sick Chick” to “Glow Warrior”, you will learn tools for how to be your own advocate, and for how to care for yourself wisely. My goal is to empower you to take charge of your health and wellbeing. 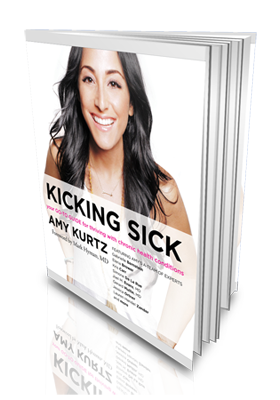 Amy Kurtz is the Author of the best selling book Kicking Sick: Your Go-To Guide for Thriving with Chronic Health Conditions, a Health Coach, Wellness Advisor, and Speaker. Having experienced a variety of chronic health issues from a young age, and having a health crisis at age 25, Amy realized that the only way she was going to recover was to become an active participant in her own well-being. Amy deeply believes in the power of self-care, and it is her mission to teach people how to truly take care of themselves, be their own advocate, and take a difficult circumstance and make it transformative for themselves. Amy’s work has been featured on Good Morning America, FOX, YogaJournal, BestSelf Magazine, Wanderlust, MindBodyGreen, and more. To join her wellness revolution head on over to amykurtz.com, and follow her on Twitter, Instagram, and Facebook for daily tips, inspiration, and motivation.